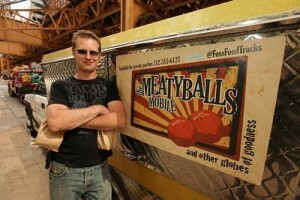 Meatyballs Mobile – Chicago, IL (@fossfoodtrucks) – Food Truck Talk – Searching for the best foodtrucks! 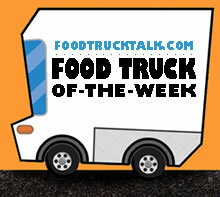 Congratulations to Meatyballs Mobile as FoodTruckTalk.com’s Food Truck Of-The-Week! What better way is there to start the new year then with Bull’s Testicles bought from a food truck that can’t prepare food on the truck? Which surprises you more? Chicago Health Department regulations prevent food trucks from actually cooking food on their truck, but you can dispense pre-made food. It’s quite the controversy in Chicago, and a battle is brewing being led by Meatyballs Mobile’s owner and renowned chef Phillip Foss. 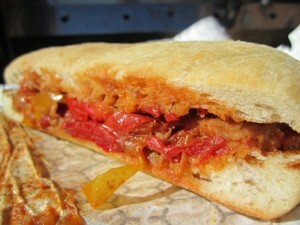 The rest of Meatyballs Mobile food truck’s menu is a bit more mainstream but clearly creative and filled with flavor. A few will attempt the Bull’s Testicles, the rest of us will enjoy sandwiches like the “BBQ Balls” with pulled pork shoulder, red cabbage, apples, and cola-bourbon BBQ sauce, the “Chicago Style Lobster Balls” with lobster, tomatoes, peppers, and saffron sauce, or the “Bouilla-Balls” with brandade, crab, shrimp, shellfish, marseilles veges, and rouille. Vegetarians are not ignored, try the Ricotta Balls with ricotta dumplings, eggplant bolognese, and parsley pesto. Stop by, meet Phillip Foss, try the balls of your choice, and be sure to find out how you can help change Chicago’s archaic regulations that are restricting the growth of the food truck phenomenan in Chicago.